When was the last time you made soup in a basket? Basketry in 2017 can range from a beautiful work of art to an impressive demonstration of craft to something you can buy at the thrift shop for twenty-five cents. But that’s not where baskets began on Whidbey Island. People were able to live on the island by using what grew here. Containers that we take for granted today were the result of hours of harvesting, preparing, and weaving for indigenous tribes. Cedar, spruce, and cattails were some of the materials woven into baskets, but those words make the process sound simple and limited. Even within the narrow niche of food preparation, baskets were made for harvesting, gathering, carrying, sorting, winnowing, storing, and cooking. The materials used to create baskets were influenced by the weight of the basket and what its intended use was. An open weave allowed dirt or rinse water to fall through. A closed weave helped in storage and cooking. A basket could be made watertight by, ironically, soaking it in water. As the fibers swelled, they closed any holes. Add more water, drop in enough hot rocks to boil the water, add raw ingredients, and wait. Keep adding hot rocks to replace the ones that gave up their heat, wait some more, and a meal is made. If you make the basket slightly different, turn it over, and stick it on your head, you have a hat. Basketry as clothing. The next wave of settlers brought new materials and methods, then the Industrial Revolution added mass production. 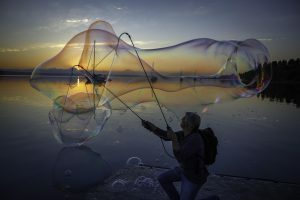 Though the old ways continue, today, they’re more a part of cultural heritage than daily living. 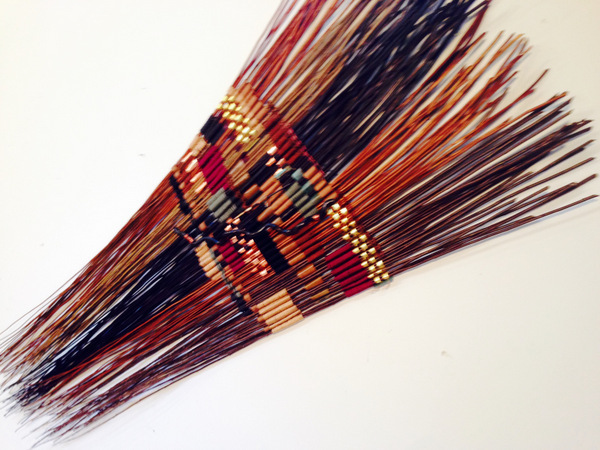 Today, there’s a resurging interest in basketry and weaving. Sure, plastic containers and tote bags are fully functional, but they aren’t necessarily fun. You can take classes in how to make your own baskets. Buy a handmade basket from a local artisan, and you can shop the farmers markets while also having something to display at home. If you want the basket to last, maybe you won’t use it, but will keep, protect, and display it. Art can exist for art’s sake, even if it has the potential to be functional. Take a look at how some of Whidbey’s artisans have extended the techniques into pieces that emphasize expression. 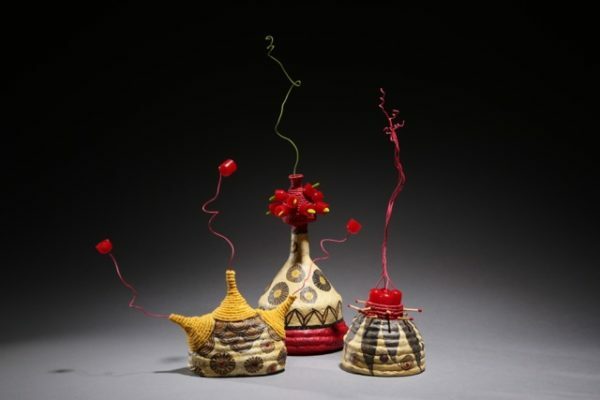 Regina Kastler’s works are functional and colorful. 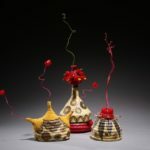 Danielle Bodine uses basketry techniques to extend her work in fiber and paper into three dimensions. Kathleen Otley’s works are more woven sculpture than basketry, but some techniques pervade. They aren’t the only fiber artists creating woven art. Whidbey Weavers Guild is a “community of fiber artists,” and a resource for learning and sharing more. If you want to see the artists and their works, visit the island’s galleries and check with the artists for tours of their studios. The Burke Museum in Seattle has an impressive collection of baskets as well. And, if you want to reach back to traditional cedar bark techniques, check out the Hibulb Cultural Center that is part of the Tulalip Indian Reservation. They’re preserving the past, keeping it current, and providing an opportunity to use those lessons today.